Regiment/Catrawd: Royal Welsh Fusiliers, 10th Battalion. Died of gas poisoning, 3rd May 1916, age 24. William Peter Macdonald was the son of William Peter Macdonald, a master mariner, and his wife Robina Helen (nee Yule). He was born in Liverpool about 1892. We first meet the family in the 1901 census for England, available on Ancestry, living at Venmore Street, Everton, Liverpool. Head of the family was William Peter, age 55, whose occupation was described as a mariner and boatswain. Robina was 40, and the children were Maud Y. who was 12, and William Peter Jr who was 9. All the family had been born in Liverpool. By 1911, they were living at Mariner’s Lodge, Sandy Lane, Prestatyn. William Peter Sr was 64, and now a retired mariner. Robina was 50, and her occupation was a shopkeeper of toys and hardware, this was also the occupation of Maud, age 22. William Peter Jr, age 19, was a solicitor’s clerk. The parents had been married for 28 years, and Robina had given birth to four children, of whom two were living. On the outbreak of war, William enlisted at the first opportunity. He is mentioned several times in the frequent updates the paper gives on local servicemen, giving details of when they are home on leave, or injured, in fact any news at all. The website Soldiers who Died in the Great War confirms the military details given above, and tells us that he enlisted at Rhyl. William’s service records have not survived. There is a card for him in the Flintshire Roll of Honour in the County Record Office in Hawarden which gives his period of service as two years, but does not give any new information. However, there are frequent references to William in the columns of the Prestatyn Weekly, he seems to have written home often, sometimes at length. In the edition of September 12th 1914, we read that Private William Mc Donald, Mariner’s Lodge is already serving in the Army. Again he is mentioned on January 15th 1915, and on September 18th 1915, we hear that he is serving with the Machine Gun section of the RWF and has just been home on a short furlough. I am quite well again now, and am at the base waiting to be returned to my battalion. What a poor lot the Huns are when it comes to hand-to-hand fight. Quite a crowd of prisoners were taken, officers and men giving themselves up and asking for mercy. I had a very narrow shave myself, and was lucky to come out of it with nothing worse than bruises. I met J. Ll. Hughes here, and spent Sunday evening with him. I hear there are several other Prestatynites here, just come from England. A big shell dropped right among us, killing and wounding a number. It is not the nicest of feelings to find oneself covered with heavy sandbags and earth, unable to breathe. I was dug out fairly quickly, and am now alright again. Prestatyn letters have not yet caught me up. However, a few weeks later, there was terrible news. The sad news reached Capt. And Mrs Macdonald, Mariner’s Lodge Prestatyn, on Saturday morning, of the death in hospital, on May 3rd, following gas poisoning, of their son, Pte. W. P. Macdonald R W F. He was 24 years of age – a young man of great promise. Highly respected throughout the neighbourhood, his death is deeply lamented. He joined the colours in September 1914, and had been in France several months. A few weeks ago he was almost buried by the explosion of a German shell near by. His injuries were not serious, and he soon returned to the firing line. I deeply regret to have to inform you that your son, Pte. 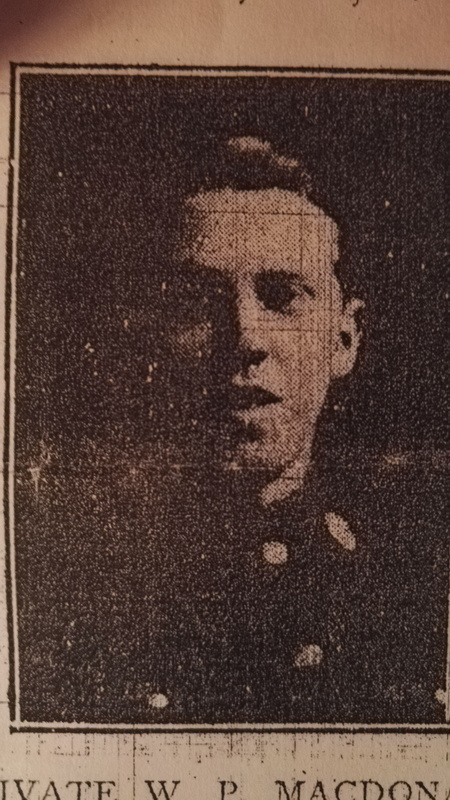 Macdonald, of this Battalion, has died as a result of gas poisoning. On the night of April 29th, the Germans made a surprise gas attack. We had plenty of warning, but your son, unluckily, took a breath of gas before he put on his helmet. Bravely and cheerfully he stuck to his post, and did not leave the trenches till the action was over. I saw him then, and he seemed fairly well, but died the next day at Bailloul Hospital. He was buried by our Chaplain in a cemetery close by. I cannot tell you how sorry I was to hear of his death, as he was one of my very best gunners, and was always cheerful under the most trying circumstances. Please accept my deepest sympathy in the loss of one, who was loved and respected by all who knew him. W, GLYN DANIEL Machine Gun Officer. An impressive memorial service was held at the Parish Church on Thursday evening. The Rev. Meredith J. Hughes, Vicar, officiated, and Captain Mandeno read the lesson. There was a large attendance, including members of the C. E .M .S . the senior members being in regalia. Mr E.T.Williams presided at the organ, and played the Dead March in “Saul” at the conclusion. In Memoriam May 5th 1917. In everloving memory of Private W. P. Mc Donald, who died at Bailleul Hospital, France, of gas poisoning May 3rd 1916 age 24 years. We cannot yet realise his death, it seems a fateful dream. You died for all of us at home, and the honour of your race. Sadly missed – Mother, Father and Sister.